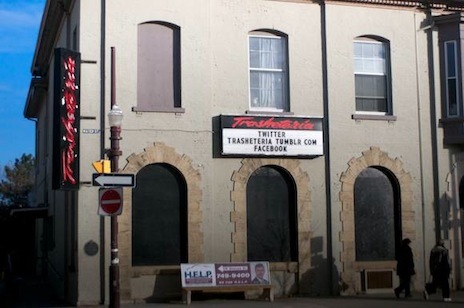 Iconic Peterborough bar Trasheteria, which employed an average of 35 people at a time, is closing down this weekend after 18 years in business, owner Jonathan Hall tells us. "Yes, it's the end of the Trash and its 18 year run," a disappointed and emotional Hall tells PTBOCanada, adding "there is talk and effort in bringing it back in the near future with the same brand." Share your memories below of what the Trash meant to you. People are already sharing their thoughts on Twitter @Trasheteria. Well friends unfortunately this Saturday truly is last call for The Trasheteria. Over the past 18 years we’ve averaged about 35 people at a time on staff and have been a proud part of the downtown nightlife community. All staff throughout the years, thank you. You’re paramount to a small business and The Trash has had nothing but the best staff from day 1. We will miss everyone immensely. We regret nothing and wouldn’t change a thing, what a trip (we really should write a book). A million or so of you have been through our doors over the past 18 years and danced the night away, done some patio schmoozing, checked out a band and escaped the mundane. Thank You. We loved our live gigs. Fiest played The Trash before she hit big with two of her prior bands, Sloan gave us indie RN’R goosebumps, Australia’s Powderfinger were mesmerizing, The Sadies psychedelic alt country made me a fan for life and The Cowboy Junkies made me sleepy, in a good way. Jordan Knight from ‘The New Kids On The Block’ Played to 100 middle aged women 6 months before reforming and selling out 2 nights at the ACC whilst 2 weeks before that ‘The Dayglo Abortions’ punk rocked all over the same stage. Gotta love it! To all the bands and even Jordan Knight (who i drove to Taco Bell), Thank you. It’s a great feeling to know that many a lasting relationship started at the Trash - bff’s, marriages, and even little Trasheteria babies! Heck, we’ve even seen a couple tattoos :) Makes us feel real good. However, We’ve run our course and its curtains for 123 Simcoe. There is interest and efforts in bringing ‘The Trash’ brand back in one way shape or form. Fingers crossed friends… We’ll leave it at that for now. To the kids that found comfort in our brand and really connected to the music our dj’s played and the gigs we booked, we thank you so much for the support over the years. Our loyal supporters - we love you, you know who you are - Keep on being beautifully weird and different, funky and cool, wild and courageous… Be safe out there and perhaps we’ll see you down that winding road.